The latest Airbus mobile app survey took an in-depth look at how professional organizations go about getting apps, how they use them, what their priorities are and what they expect of their app vendors. The results deliver some surprises. Which ones? Download the report and find out! How professional radio communication helps tackle extreme circumstances. The white paper looks at the challenges related to exceptional circumstances, defines the characteristics of a PMR network that meets those challenges and examines some actual solutions that have helped emergency services cope with extreme situations across Europe and beyond. What are the options for a PMR network operator to adopt new broadband solutions? What is the best way? What can be done right away? And why is it so important to maintain control? Start your future today! Get expert advice for step 1 in your PMR evolution from TETRA to broadband. Using apps that provide data and video in the field can mean better efficiency and safety for the users. This document gives pointers for driving and planning the introduction of mobile broadband and mobile apps. Know how your network is performing - how to overcome the new challenges that critical communications service operators face related to controlling the service quality in a hybrid network environment. RENEWED eBook: How to be smarter about buying TETRA radios – Write a better radio RFQ/RFP and get what you need. If you’re looking at how to buy TETRA radios for your organization or for your network, this document is a good place to start. Download this eBook and learn to write your radio RFP/RFQ so you'll get what you really need! Wouldn’t you like to get better operations… and save money? There are five radio features that can deliver these benefits. Take full advantage of the radio network you use. Download this eBook and check that your radios – or the ones you are thinking to buy – deliver the five features that can save you money. This eBook tells you why TETRA continues to be the right investment for any organization looking for a secure, truly mission-critical communication system. Download the eBook and learn the 50 reasons why TETRA can - and will - continue far into the future! Many authorities and public safety organisations would like mobile broadband to be part of their communications. Download this white paper and you will discover how hybrid networks can help achieve this. Download this executive briefing and learn how an airport can adopt the hybrid network model and secure its existing investments in communications. Download this executive briefing and you will learn how to complement your TETRA network with broadband and adopt the hybrid approach. The hybrid model means that the mining company can continue to use a TETRA network for mission-critical voice and data and introduce mobile broadband services step-by-step. This paper explains how this hybrid model can best be achieved. Quality of Service (QoS) is a prerequisite for critical communications services. Learn about the prioritization mechanisms which need to be available also in commercial mobile network operators' (MNO) networks used by mission-critical users - and more! Download this paper and you will learn what is needed to bring mission-critical broadband to life on 4G/5G networks. Priorities are important for ensuring that public safety users and public safety apps get the service they need - even when a network is congested. 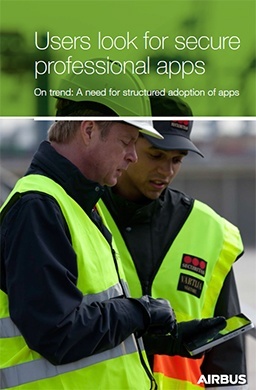 How to ensure that public safety apps get the priority they need? Are you planning to buy a new radio system? Be sure to look at five key things related to the investment. What about your day-to-day operations? Do not make a shortsighted choice for your new radio communication system. Instead, consider five important things that can affect your everyday operations. This guide tells you the truth about five common but wrong ideas about TETRA radio communication in hospitals and in medical care. IP migration paves the way to public safety broadband. Download this detailed guide and find out why IP migration is important and why it's an important step to take. Mobile Network Operator: Download this brochure to learn how you can grow your business and expand your portfolio with collaboration solutions. Tactilon Agnet is a professional group communication solution that lets smartphone users contact their teams at the touch of a button. Learn more by downloading the product brochure! Tactilon Dabat is a professional smartphone and full TETRA radio in one device. Download the brochure to get to know what this game changing hybrid device can do! Did you know that more radio power will not give you a much better range in Direct Mode (DMO)? This infographic shows the differences and shows you the best way to achieve the best Direct Mode range. Download an print this infographic for your quick reference! Do you have this wrong idea about IP protection ratings for PMR radios? Check this infographic which cracks the IP rating code for you! Never get lost in the jargon jungle again! Download and print this cheat sheet for your quick reference.